The north of Scotland has the biggest variety of whale and dolphin species in the UK, according to the latest survey. Sea Watch Foundation has been holding the annual National Whale and Dolphin Watch event for 15 years. It is a collaboration between citizen scientists, wildlife enthusiasts, the general public and researchers, which aims to raise the profile of Britain’s whales, dolphins and porpoises whilst finding out more about their distribution. Members of the public were invited to join organised whale and dolphin watches around the UK as well as conducting their own surveys and reporting their casual sightings. From the Upper Moray Firth to Cape Wrath and including Orkney and Shetland, on average between one and five of the mammals were spotted every hour during the survey, which took place between July 29 and August 6. 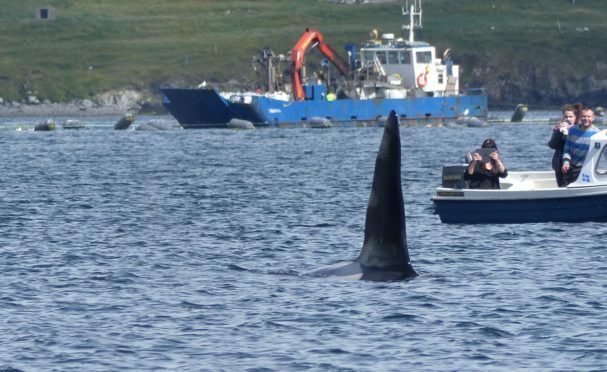 Memorable sightings included many killer whales in the north of Scotland and long-finned pilot whales in the Moray Firth. In the region, there was one report of 15 white-sided dolphins, the only instance of this species being spotted anywhere during the event. There were eight recordings of bottlenose dolphins, 39 spottings of harbour porpoise, 37 reports of killer whales, three of long-finned pilot whales, 15 of minke whale, 11 of Risso’s dolphin, five of short-beaked common dolphin and eight recordings of white-beaked dolphins. The rest were unidentified. Kathy James, sightings officer for Sea Watch, said: “It’s so important for people to join in helping us to track whales, dolphins and porpoises in UK waters. “The Sea Watch Foundation database holds hundreds of thousands of records which are used by scientists and governments to inform research and policy on these wonderful animals. Orkney and the north of Scotland as well as South Grampian saw the highest species diversity with eight species recorded in each. Shetland and north east Scotland also recorded high species diversity, with seven species reported in each region. The Outer Hebrides showed a very high species diversity for the number of sightings recorded, with five species. Throughout the UK, 1,410 records of cetaceans were reported from land and at sea. The Sea Watch Foundation is seeking volunteers to come forward to take part in the National Whale and Dolphin Watch 2018 this summer, which takes place from July 28 to August 5.